I flew up to Boston for the Conscious Capitalism® Conference last year out of curiosity, not with the expectation that two days of speakers and conference hobnobbing would shift my work and life. But it did. It offered up a community, framework, and lexicon that were both inherently natural and alluringly new. 1. 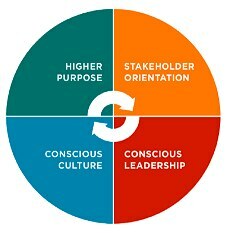 Conscious Capitalism gave me a broader framework in which to think about business and social impact. My work before primarily focused on external outputs: how can a company positively impact its suppliers, consumers, community, or environment? But I realized that looking only at external outputs is incomplete. It’s the systems, policies, culture, practices and values within a company that make possible any positive outputs like reduced waste or strong supplier relationships. To maximize impact, it’s critical to first understand and be able to work with company culture and systems. Put another way: as humans, we inherently want the same positive outcomes for our lives and world. When we build the systems and the culture to allow us to practice these inclinations, we see positive outputs, such as more equally distributed pay or increased employee education. This evolution of understanding has impacted the nature of my work, the clients with whom I choose to work, and the writing I do. The quality of conversations I had at last year’s conference was so high (and so honest) that I wanted more when I returned home to Washington, D.C. To find and create these conversations, I organized an event for Conscious Capitalism businesses, practitioners and enthusiasts. Although I’ve since moved to San Francisco (more on this below), people from the event remain in touch and are actively growing the D.C. community. To kick off the next week’s conference, I’m co-hosting a reception and dialogue focused on women in Conscious Capitalism. The event is open to both men and women. Please join us if you’ll be in town! 3. I’ve become more conscious. Admittedly, I just wrote this and wanted to delete! and replace it with another outcome, but I’m forging ahead in honesty. Being exposed to people who were leading engaging, intentional lives helped me to think more intentionally about my own and to recognize the choice I have in it and the responsibility of this choice. I switched my environment, moving back to California. I switched how I relate to and engage clients. It’s no longer just about delivering product; I’m now more attuned to the motivations, concerns, and fears of the entrepreneurs and executives I work with. By understanding these, we’re able to make deeper shifts than we would have if we only focused on creating a partnership strategy and pipeline, for example. And I meditate. Ninety-five percent of our days seem directed by outside stimuli so I take some time each morning to turn inward. Having shared all this, I should be clear that the intent of the Conscious Capitalism Conference isn’t personal transformation (that is, no fire walking sessions). It’s designed for business owners, executives, and nonprofits to learn to apply the principles of Conscious Capitalism. The speaker roster reflects this pragmatic approach: John Mackey, CEO of Whole Foods; Casey Sheahan, CEO of Patagonia; Eric Ryan and Adam Lowry, co-founders of Method; Kip Tindell, CEO of the Container Store; Liz Maw, Executive Director of NetImpact; Teju Ravilochan, co-founder of the Unreasonable Institute; and Jay Coen Gilbert, co-founder of B Labs, among others. I love how honest you were with Point 3. Someone just told me about this documentary Jiro Dreams of Sushi, about the best sushi maker in the whole world. The film follows him and shows how he continues to push himself to even be better with his craft. He did not proclaim to create his “perfect tasting menu,” until he was 78. I feel like we always push ourselves to be better and more conscious in our decisions and our work. I am excited to hear how the conference goes this year. I spent much of this past weekend in Barnes and Noble reading John Mackey’s “Conscious Capitalism”. This topic has interested me for a while but I respectfully disagree with the direction he, and many others, take. Whole Foods offers a product (local and organic food) which is skyrocketing in demand. Kroger, Safeway, Walmart, etc have also moved to offer these products not because are suddenly “conscious capitalists” but because that is what consumers want. Not everyone is willing to pay a premium for local and organic food which is why it is wrong to suggest that Whole Foods is “superior” to other grocery stores. It is consumer demand that drives social responsibility, not altruism by the elites. It is the job of business to innovate and meet consumer demand. Whole Foods has done that and others are adapting, because the pursuit of profit dictates them to. Just some thoughts. Love the blog though. Great discussion. I agree that others are adopting to provide organic food, in this example, based on consumer demand. I would offer that consumer demand is only 1 driver of social responsibility. In the case of Whole Foods and other companies practicing Conscious Capitalism, it goes far beyond product to how they treat and work with employees, suppliers, the environment, and even shareholders. Whole Foods takes stock of the environment, for example, and makes decision based on how the environment, as a stakeholder, will be affected. You mentioned an overlap in what’s good for business and good for people/planet. It’s finding this opportunity where both are aligned that defines a ‘Conscious Capitalist” company. Thanks for the discussion and glad to hear you find the content here useful. I see where you are going with that but every company strives to treat workers well, have good relations with suppliers, etc. It is good business (ie profitable) to do this. Whole Foods can do this better because they offer a more differentiated product that has higher margins and consumers who are willing to pick up the cost of better addressing these issues. Most other grocery stores sell on price because that is the highest priority of their consumers so they do not address the environment and other issues as much because their consumers aren’t willing to pay for it. Whole Foods may be more socially acceptable but the fact that so many more people go to other grocery stores that compete on price means that other grocer stores are the best available option to many consumers. It would be great if all companies take stock of the environment like Whole Foods and others but this action comes at a cost. Some consumers are willing to pay for it and others are not. This is why I believe it is misguided to think that Whole Foods is better than other grocery stores since they serve people with different consumer preferences.